Every time you talk, write, design, post, respond, launch, thank, and connect with others… you’re exercising your brand voice. Whether you think about it or not. People are building up an impression in their mind for all the ways you appear—online, on stage, on the phone, or in person. Don’t you think it’s best to be deliberate about all that? To convey the voice and vibe for your ongoing message? So that your fans, followers, readers, listeners, leads, prospects, and customers ‘get it’? Should I stop asking so many questions? Fine. But you shouldn’t. Not for a second. Otherwise, you’ll be seen as a commodity, fitting in rather than standing out. With eyeballs glazing over instead of into your social media posts and content. Now let’s move into the hows. When I start working with clients, I give them a worksheet with about 25 questions. Some of them to help determine their brand voice for their copy and design. Thinking of your brand’s personality… if it was a celebrity or public figure, who would that be? In other words, casual and humorous + good looking and confident + stylish and a bit cocky, too. Plus, friendly like Bugs Bunny. It’s one way to zero in the voice I use for everything I do. Again, for your brand’s personality—what adjectives will describe your vibe and tone? Pick 10 below. Or any others on your mind. I keep these characteristics close to my business psyche. This shows up on my web pages, in my blog posts, in my email responses to leads, on my email signature, even in my proposals to clients. Wherever I have a chance to be seen, heard, or noticed. It’s all part of the “Be the brand you always wanted to be” mindset. Because fancy terms take up space and brain cells—while saying little. Except stating the meaningless does say something about your brand. The wrong thing. Remember, everything you do, show, and share is some kind of tell tail. Jargon alienates audience members who don’t immediately understand what you’re saying. They feel dumb. Or, they just dislike you when you say transform, disrupt, and innovate. Same with bandwidth, optimize, holistic, synergy, and viral. Here’s more of what not to say on social. Avoiding jargon forces you to be and sound real. No longer can you glom onto these words. You must describe something useful for your readers, using human sounding words. Got something new to write or post? Maybe explain it first to your mom, kid, or cousin? When an outsider ‘gets it’, then you’re on the right path. Too many brands and marketers write sensational headlines to catch attention in the over-crowded digital universe (a.k.a. clickbait). Such as, top, best, worst, need, and only. People might click more on your posts—for the short term. But soon after that, they’ll see you as fake when you can’t deliver on the headline. Plus, people buy more on lifestyle, mood, and emotions more than features. Building up your brand over time with a story around fun, different, helpful, happy, exciting, non-mainstream, and others are ways to connect with people. As long as you’re truthful and honest. So please, drop the theatrics—it’s noise. Every time you write about you, you lose a chance to connect with them. Inadvertently, your voice becomes selfish, not selfless. I wrote here on how to write to your social devotees. That’s it. Just this quick reminder, everyone wants to know what’s in it for them (not you). Like I said at the beginning, everything you do and share is part of your brand. One person posting on Facebook? And… others writing content across your website? Chances are, they aren’t all using the same voice and tone—but should. Well then, get the gang together to make sure all your fans and followers are getting the same meals for their eyes and ears. How do we improve people’s’ lives? What tone does our audience use with their people? What don’t we want others to say about us? Get on the same wavelength by sounding and speaking consistently, no matter where your brand shows up. Most people talk more than they listen. Brands included. Posting is good. Engaging is better. Otherwise, you’ll come off as me-me-me. Use social monitoring and social listening to come off as we-we-we. Whether you do this by using a real person to answer questions and address comments, or a social tool—keep a real and worthwhile conversation going. Here are some excellent tools to help. This is a powerful research approach, too, knowing what people think (good or bad) about your business, products, and services. This video from Hootsuite Academy has even more tips on how to build a unique and powerful brand voice on social media. 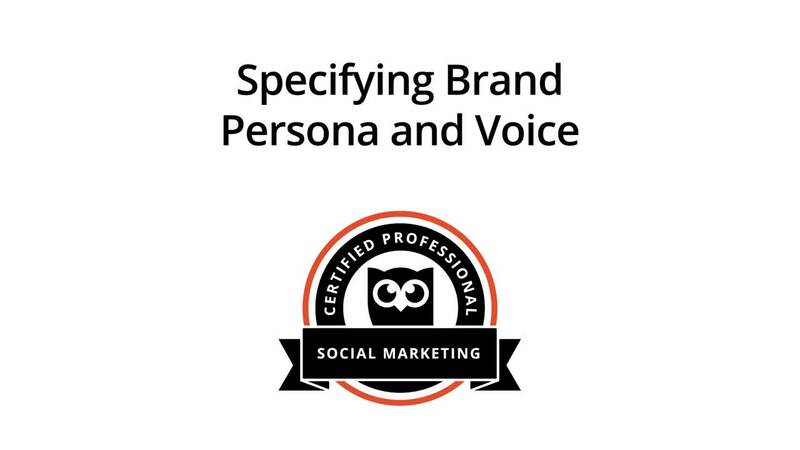 Some examples of brand voice for social media. Their adjectives: Soothing, inspirational, motivational. And of course, calm. Calm is an app for meditation and sleep. They suggest techniques and tips for improving mindfulness. I’d say they’re mindful of sticking to their voice-and-tone guns, for all their tweets and Facebook posts. Big time. See for yourself at #YearOfCalm. Their adjectives: Inspirational, family-oriented, and clever, too. And yes, honest. The Honest Company sells baby, home, and personal products free of toxic ingredients. From their site to their posts—on Twitter, Facebook, and Instagram—they let their voice be heard and seen. Consistently. Check out Jessica Alba. She’s winking at you (if you hit the play button). They know their brand voice and spread it all across social media nation. Getting inspired? Let’s keep going. Their adjectives: Creative, fun, practical. That’s Sharpie’s voice. They spread it on Instagram, with loads of posts, videos and followers across five hashtags. Inspirational, too, with all the ways to use a sharpie to create beauty. Here’s a few that caught my eye. Sharpie let’s their followers enhance their voice—with their product. Nice, eh? Their adjectives: Helpful, personal, compassionate. Who said finances had to be dry and boring? Mint (by Intuit) is a personal finance app to manage your money. Create budgets and check credit scores, too—all from a single web app. Many people have struggles with their funds. Mint posts plenty to provide hope, tips, and relief. Their adjectives: Weird, witty, irreverent. Need I explain what Taco Bell sells? Didn’t think so. And, why not have some fun, it’s just food, right? Another example of how people don’t just buy your stuff—they buy your brand. You can get tacos all over the place. But creating a following with a slew of posts that make people chuckle, think and go ‘oh my’ is one way to win hearts and gain followers. Their adjectives: Offbeat, conversational, wry, and not-so-serious. Boy, do those adjectives come across clearly in everything they do. They even have a public style guide for their voice and tone. Mailchimp helps businesses become the brand they always wanted to be, with their digital marketing tools. They revamped their site, tone, and voice recently. With absolutely the best images I’ve seen anywhere on the web—all matching their words. Raise your hand (or paw, or wing) if you are excited for Halloween! See more of Mailchimp’s ways-and-means on Instagram and Twitter. Maybe a picture’s worth less than a thousand words. Taking Stock is an original series about the day-to-day struggles of living the dream in a stock photography agency. Where are you showing up on social media? Actually, how are you showing up? As you can see, it’s critical to be perceived in a deliberate way—consistently. Everything you do is part of an ongoing conversation. People want to be part of a bigger story. Include them in yours. Promoting your voice and tone across all your social media channels from a single dashboard using Hootsuite. Easily schedule and publish posts, plus monitor and analyze your efforts to prove ROI. Try it for free.